The Blue Sea Hotel is a great place to stay we all had a fabulous holiday the children were entertained, by a the anamation team and they looked forward each day to the mini disco. We found the team were all frindly and helpful at all times the entertainment that they put on each day was excellent. The staff were very friendly and you could not have a more helpful group if you tried, the restaurant staff from the manager to the waiting staff and the chef and his kitchen staff, they just could not do any more than they did for us, even to providing a cakefor my husbands birthday with the greeting that our daughter asked to hae wrote on it.the ba staff both in the hotel and the entertainment area were friendly and prompt when serving us. the rooms were clean and the maids always cleaned the rooms and made us feel priviledged to be there. The "Boss Man" was on site all the time he always said hello and always spoke or caressed our youngest grand child who was 11 months. We would all recommend this hotel to all. This comming year they are refurnishing the hotel so we are all hoping to go back again in August 2008. The hotel was clean, although the rooms were very basic and old fashioned! Food - dreadful, frankfurt sausages etc etc nothing geared towards the English! Location was great - close to malia and could have either lazy nights and days or lively. There was very little if any entertainment. I would not be returning to this hotel! Extremely disappointing!! We stayed in this hotel in June 2004 and loved it. We stayed in the hotel itself rather than the bungalows and the rooms seemed much better. The food is geared towards the French, but that's because this is a French all inclusive hotel. Its not the usual chips with everything, which we liked and you soon get used to the types of food available. The Thomson reps eat at this hotel so the food can't be that bad. It is in a lovely position opposite the beach with water sports right outside. The hotel owner is a lovely man and always buys you a drink when he sees you. Watch out for Nikkos (chef) at the pool bar, he will get you drinking shots all day if he can. The evenings are as lively or relaxed as you like in Stalis. There is a great bar called Dwyers that has live music every night, my daughter is 13 and loved it. The French were very friendly and always wanted my daughter to be on their side on the water polo team. We ended up spending a lot of our time with a French family and one of the reps (Ifra) and Nikkos (pool bar). If you want a mix of nationalities in a relaxed hotel then this is the place for you. If you want bingo and chips then I would suggest you try a hotel at the opposite end of Stalis towards Malia where it is a bit livelier. This hotel has its own website where you can book directly. It can be booked for room only or half board. The price is per room not per person so works out a lot cheaper than booking through a travel company. It's half an hour or so from the airport so taxis are fairly cheap. All in all a great hotel and an excellent resort! This was supposed to be our first good holiday as a family,it turned out to be the worst holiday ever and we were looking forward to coming home after only 5 days. The Hotel itself was situated very conveniently to the beach and we were looking forward to the sea views, unfortunatley,we could not even get in our room that was allocatted to us as the 3 beds and 1 cot all in a line along one wall meant that we could not even get our luggage or the baby's buggy into it. but the next day we were moved to a family room off the complex with a view of a scrap yard and goats field! The food was very much orientated towards the German and French tourists and was monotonous to say the least,in fact there was nothing at all for children,it was very poor indeed! The kids club did not start until our 5th day and when it did,it started at 7 at night until 9,the same time as the restaurant which meant we had to spend more money on eating out despite going half Board. There was literally nothing to do unless you were either very lazy and stayed by the pool all day or you had thousands of euros spending money to go on excursions, which were again in german and French narration! The kids were bored,the adults were miserable and I would not recomend this hotel to anyone.The one plus point however was some of the staff,they were very friendly and concerned about us,most of my youngest son when he got suspected food poisoning at the resort! 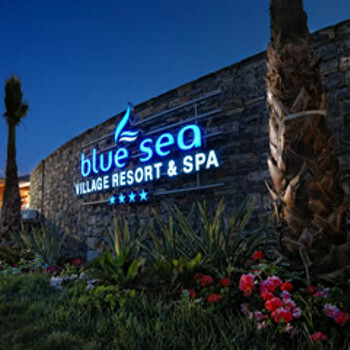 Our first trip abroad with my 3 year old we went to the Hotel Blue Sea in Stalis, we booked it because it not only offered half board but because it also had the added bonus of childrens clubs and activites. The hotel was closer to the airport than the brochure said so we were one of the first to be dropped off which was great...on arrival the hotel looked lovely, the reception area was clean bright and airy and the staff there were lovely and friendly too. the owner was there to greet the families who had arrived and we had a smashing little man who helped us down to our rooms. Its not a typical hotel layout, with the rooms being in bungalow type setting, amongst lemon trees, grape vines and lots of benches to sit and rest amongst the vines and things. The whole complex was very clean and tidy, bins dotted around and about were emptied regularly and the rooms themselves were cleaned daily by wonderful cleaning staff! The rooms were basic but comfortable, each with a balcony or terrace on which to sit. They were clean, tidy and quite spacious even for the 3 of us, they also had larger family rooms. The restaurant was clean also, and you could dine outside overlooking the beach and the sea which was a lovely setting. All the staff were friendly..especially our waiter who we tended to stick with cos my little boy loved him and looked for him at breakfast and dinner! The food selection was varied with several choices for dinner, there was always plenty to choose from with excellent cold buffet and a separate childrens buffet. Only complaint about the food was that it was aimed at German tourists more so than anything else, and this was particularly noted at breakfast when there were frankfurters every day...but plenty of juice and lovely bread! Drinks in the hotel were expensive which was a bit of a disappointment, and no drink was provided with the meals at all. However they had a great selection of wines with the house wine being local but excellent. The swimming pool was good, and there was a good kiddies pool and playground and although we went there so we could use the kids clubs we didnt use them at all. It was difficult at times to get any loungers by the pool and they were taken up with towels being on there from as early as 5am and no-one going to them til later in the day. But there were plenty on the beach. The entertainment we didnt use either as tended to go off site as there was plenty of choice locally. The "animation" was taken on by the germans though, but not so much by the others staying there. The location of the hotel was excellent, literally across a small road to the beach, situated close enough to plenty of tavernas and some excellent local shops. Would definitely go back to the hotel as it was lovely, but maybe if it was self catering or bed and breakfast.